Great idea! I can see this being used to automatically turn on those giga-watt Christmas displays once the sun goes down. Ok, i don’t get this. What is that schematic? Why is there an op amp with one floating input? And as it’s been noted by HAD, the idea itself is very very unsuitable. I’ll agree that the circuit implementation is pretty odd… especially using that extra op-amp in the 12V version. Doesn’t seem entirely necessary for that… A while back, I built a vented cat litter box that used a PC fan to draw air through the filter. A 555 timer was used to run the fan (via 2n2222) for 20 minutes, and it was triggered using a phototransistor (break-beam IR arrangement). A potentiometer was added to provide an adjustable trigger point. Can someone here more experienced than I (not hard, admittedly) explain what he needed that op-amp for? 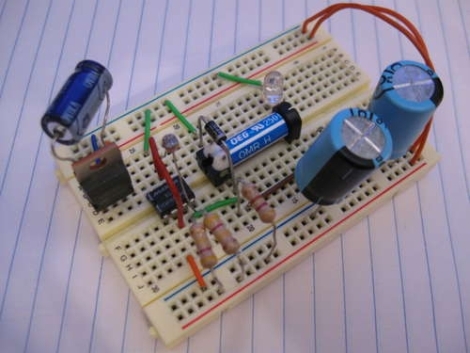 Knowing that LEDs act as weak photocells, one could use a 555 and a LED and an OR gate to make a light level detector. When you charge up the diode in reverse, it retains a charge that bleeds off at a rate depending on how much light falls on it. Following the output of the 555 and the charge of the LED at the same time lets you detect when both of them are at a logical zero. That is, when the LED recieves enough light that its charge drops to logical zero before the 555 can pulse it again, another circuit can be triggered. When the light level is low, either the LED or the 555 will be at logical one at any given time. Right to the point! The only correct (and straight) answer among all these nonsense.